We do not sell, give or share your information with any 3rd party. We support nearly all cash drawers, printers, computers and tablets. We work great on Windows, iOS or Android devices. We even have built in StarPRNT features for easy network setup. We have less than 48 turn around for integrated processing with Vantiv Worldpay and work with all processors through terminals. 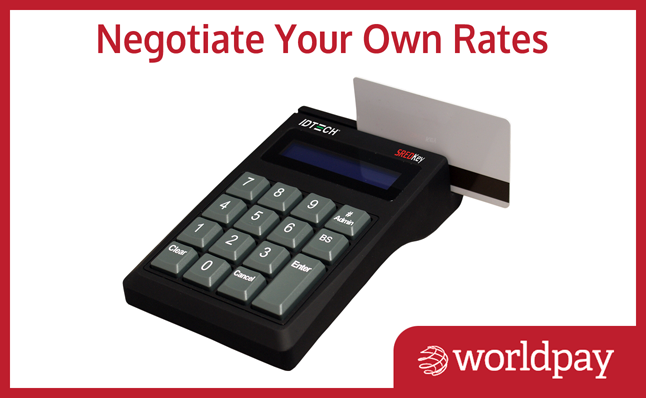 Unlike our competitors, you can always negotiate your own credit rates. 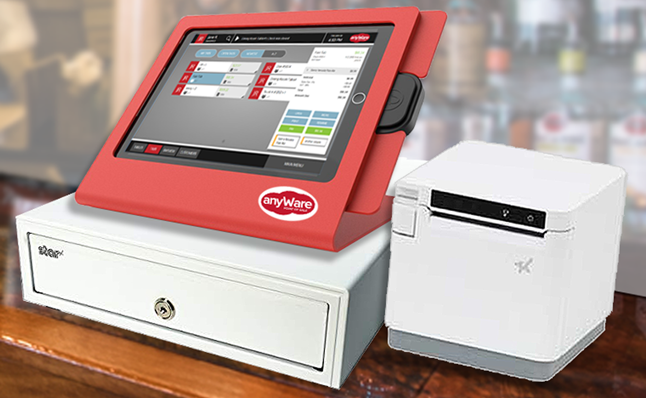 anyWarePOS runs on ANY modern web browser on any computer. 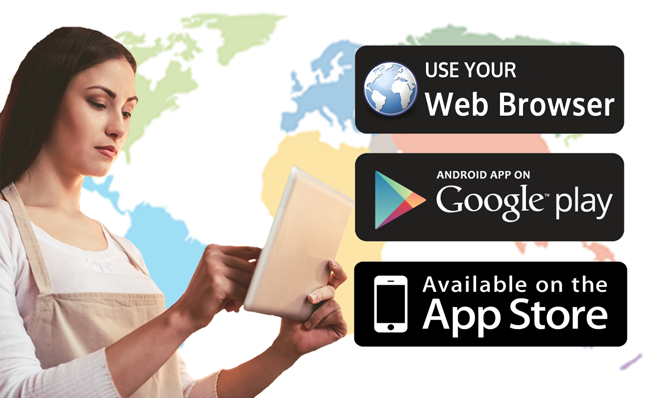 We also have created NATIVE Apple iOS apps for iPhone or iPad and Native Android apps. Download us in the Apple App Store or Android’s Google Play Store. Unique, well thought out features that increase profit. Look at the contents of a check without opening the check right from the tabs screen. 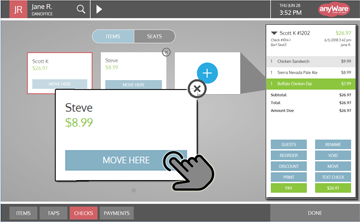 Pay, print or reorder the most popular items all without leaving the tabs screen. 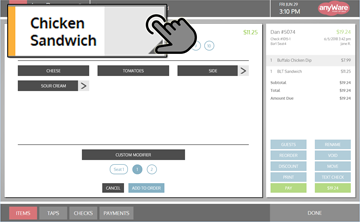 Touch the left side of a button to instantly open an order or order an item. Touch the right side to take a peek at the check or modify an item. Create as many checks per party as you need. Easily move items from one to the other. Cash them all out separately with different payment methods. Easy to use features that just work. 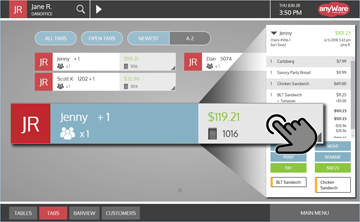 Quickly view your customer's preferences, visits or spending habits. One click text the menu or specials. 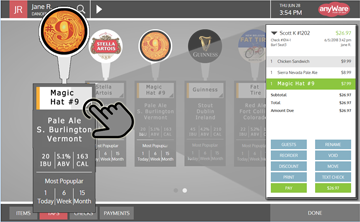 Manage your bar with a visual representation of the customers in front of you. 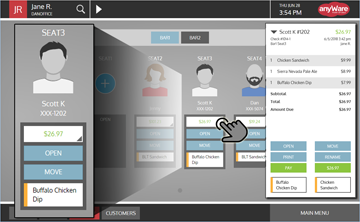 Setup avatars and on click ordering of their last beer. View and manage your Tap Wall just like it is on the wall. Branded tap pulls make ordering a cinch.